Back in July the government outlined its rail investment strategy in the High Level Output Statement (HLOS) covering 2014-19 or Control Period 5 (CP5). We reported on the HLOS here and here, and a rich discussion ensued. Looking again at the HLOS, we explore whether it presents a viable strategy for London’s pressing rail capacity problems. Clearly the HLOS offers little new investment for London, although projects elsewhere such as East-West Rail could benefit London by reducing cross-London freight flows. Electrification on the GWML and MML are welcome, but it’s hard to ignore the persistent inability to upgrade GOBLIN. What is the rail investment strategy for London and, as the HLOS deftly circumnavigates this, how will it be created? Will the HLOS metrics actually exacerbate the problem of overcrowding in the city core, rather than support a long-term reshaping of the rail network? How will HLOS deliver sufficient stability and time to plan the major 2015 timetable changes, given the franchising debacle? As time presses, we await DfT’s reviews of the franchising process and the Network Rail and industry Strategic Business Plan in January 2013. Hopefully this will fill the HLOS gap and present an integrated investment package for London’s rail network. But if it does not, will TfL take the initiative? Will it create a coherent picture of what the London rail network should look like, and present a bold but tenable strategy for London rail for CP5, CP6 and beyond? 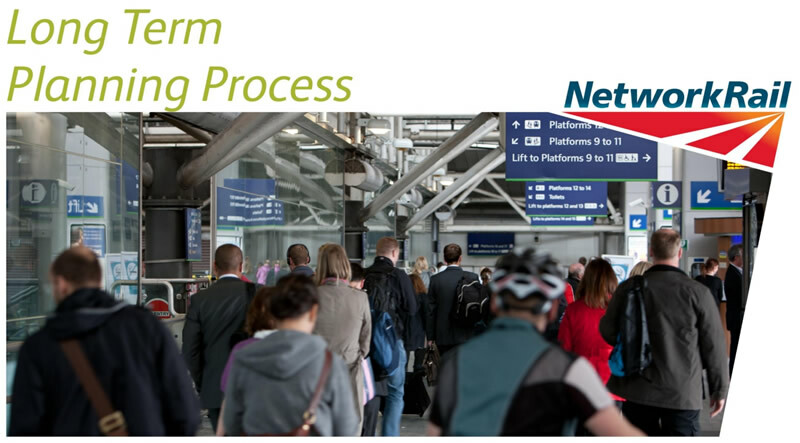 The Secretary of State expects the majority of further CP5 enhancement to be identified by the rail industry in response to her requirements to provide for additional peak demand. She wants these enhancements to include efficient provision for likely demand growth beyond CP5. So what exactly is “the rail industry” and how is it expected to come up with an investment package? What process is in place, and who will take the lead? Formally, the “rail industry” is the group responsible for the 2011 Initial Industry Plan (IIP): the Rail Freight Operators’ Association, the Railway Industry Association, the Association of Train Operating Companies and Network Rail. The work on the IIP was led by the Planning Oversight Group, which also consulted other cross-industry groups and drew upon the Rail Utilisation Strategies (RUS). Led by Network Rail, the RUS process yielded a detailed shopping list of options, but not an investment strategy. The RUS process has now come to an end, to be replaced by the Long Term Planning Process, which have kicked off with a series of Market Studies, including one focusing on London and the South East. Something to write about next year perhaps, but for now let us focus on the key issue – what is the ‘Short Term Planning Process’ for London? Alongside the RUS process led by Network Rail, TfL has started to fill the strategy vacuum with its February 2012 Mayor’s Rail Vision. 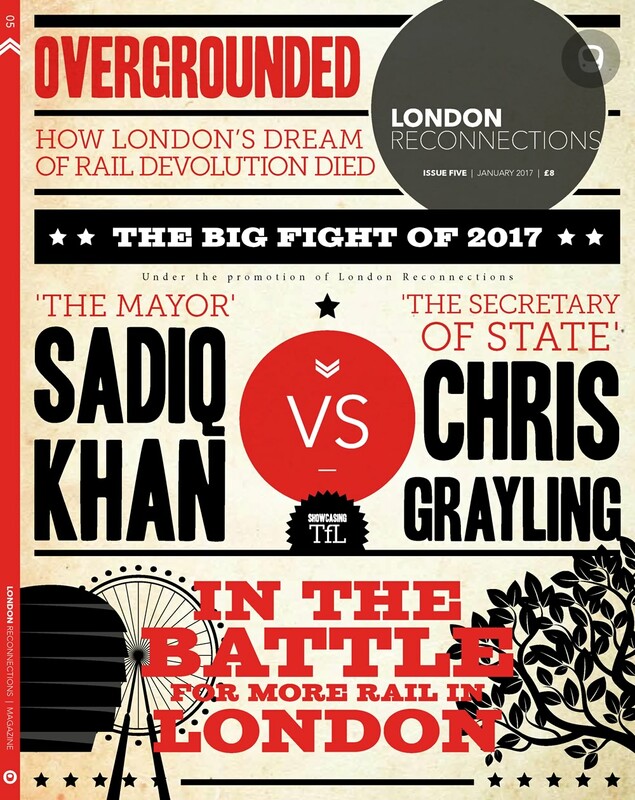 This confirms the Mayor’s ambition to progressively take responsibility for London’s rail services using the Overground concession model, but it is a step short of a strategy for the London network as a whole, and it is short on investment detail. PR13 will involve extensive participation and engagement between ORR and the industry. Each of the various stakeholders will be making their own suggestions to ORR about what should change and Network Rail will need to continue to provide compelling arguments and top quality evidence to ORR during the review. So it appears we are now in a period of behind-the-scenes lobbying and discussions, in the hope that new rail investment for London will feature strongly in Network Rail’s Strategic Business Plan, and will be factored into the ORR’s regulatory framework. What is TfL’s role in this? Clearly it will continue to promote its recommendations, which remained conspicuously absent in the HLOS, and it will push for options identified in the London & South East RUS. But inevitably there may well be reluctance from NR to include investments that DfT has shown no inclination to fund in the HLOS or elsewhere. It is also unclear how TfL is empowered to fulfil its broader strategic planning role, which would allow it to take a lead in developing a rail investment strategy for London. Given this, it is very likely that the Mayor is looking beyond the constrained and bitty territory of rail funding, to devolution and greater financial powers, which would encompass rail investment. Making a full contribution to rail industry planning by guiding the production of the industry’s Strategic Business Plan in response to the High Level Output Specification. Let’s not forget the Strategic Freight Network (SFN) Steering Group, of which London Rail is a member, and which we looked at in our posts on freight. This will presumably be making recommendations to the DfT on how to spend the £200m ring-fenced for freight, although this is over five years and for the whole of the UK. The serious tensions that exist between industry players and expressed in interview illustrate how immature the current structure actually is. These tensions and behaviours of the industry lead to weaknesses in planning, weaknesses in decision making and the predominance of infrastructure solutions as outcomes. These are the final three substantive issues identified by this study. There is little consensus on what to do to address some of these issues. Since then there has reportedly been a significant shift within the industry. The IIP process demonstrated how the industry can come together to create a draft plan. A plethora of working groups oversee the various components of the overall plan, and these afford the opportunity to further build familiarity and productive working relationships across institutional boundaries. The deliberations of the RDG, though arguably short on tangible outputs, are helping to build trust between stakeholders. Throughout the industry there is more pragmatic approach, and a recognition that no single organisation holds the levers and that the network requires collaboration and partnership in order to function. Our heart-warming memories of the Olympics may also have permeated the industry, especially in London where everyone had to work together to ensure that the transport system was co-ordinated and resilient. This unexpected by-product of the Olympics may well become an important foundation towards a more integrated transport strategy for London, and it’s a fascinating and reassuring story that we’ll return to in a future post. Yet still, at present, the procedural and institutional framework has led to a situation where London is looking at a major capacity problem and investment gap, and there is no integrated rail strategy for the capital that clearly maps out an investment plan for CP5, CP6 and beyond. In short, the Department for Transport’s strategy for rail investment in London is to leave the strategy for someone else to create. It assumes that this will be achieved through the Strategic Business Plan, and that this process is sufficient for the various stakeholders to assess the different investment options. The above may present the first reason to question whether the HLOS presents a viable way forward for London, but it is not the only one. A second is that the HLOS has built in new targets (or “metrics”) based on London terminal capacity. The nascent rail investment strategy for London is expected to deliver against these targets. There is a deeper discussion on whether such performance targets are a credible and intelligent approach to governance and delivering public services, albeit through a quasi-private sector model. The more pressing question is, however: are these valid targets? If not, the DfT may be about to create a bigger problem than the targets appear intended to solve. The 2011 London & South East RUS also has data on passenger numbers, but these are for 2031 so they do not easily compare. The table below shows the forecast gap between capacity and forecast demand based on currently committed schemes only. The negative HLOS numbers result from Thameslink and Crossrail, which post-2018 will transfer demand from the terminal routes. It would be interesting to know how the 2018 and 2031 data correlates. So, are demand and capacity at the termini appropriate metrics to use? Unsurprisingly, most people travel to London not to visit a terminus but to travel on elsewhere, as detailed in TfL’s 2011 report, Central London Rail Termini: Analysing passengers onward travel patterns. Shouldn’t the metrics reflect how well the London rail network is in taking people to their destinations? Should they also factor in the relationship between transport and land-use planning, which is built into the more nuanced and comprehensive Railplan model used by TfL to create their demand projections? Our posts on the London termini explore how it is a historical oddity that encircled the city with a ring of stations, which is inexorably throttling it. This ring was defined in 1846, when the population of London was around 2.5 million. The population of the London metropolitan area is now over 12 million, but commuters are travelling from much further afield. The London travel-to-work area covers an area of 20m+ population, but these trains still concentrate on essentially the same core as 150 years ago. Bowing to the laws of physics, there is a limit to the amount of people you can squeeze into a given space. As the city core becomes more congested, there is also a practical limit to the amount of rail infrastructure you can feasibly provide. At some point, arguably now, you need to expand the core. Travel patterns respond to the supply of transport, particularly with heavy rail. Increasing supply of the same rail pattern will further concentrate demand, which is exactly what the HLOS metrics will encourage. Granted the London economy is not really polycentric, and there are strong economic and social drivers to agglomeration. Indeed this ‘clustering’ effect is an important component in London’s economic, land-use and transport policies. 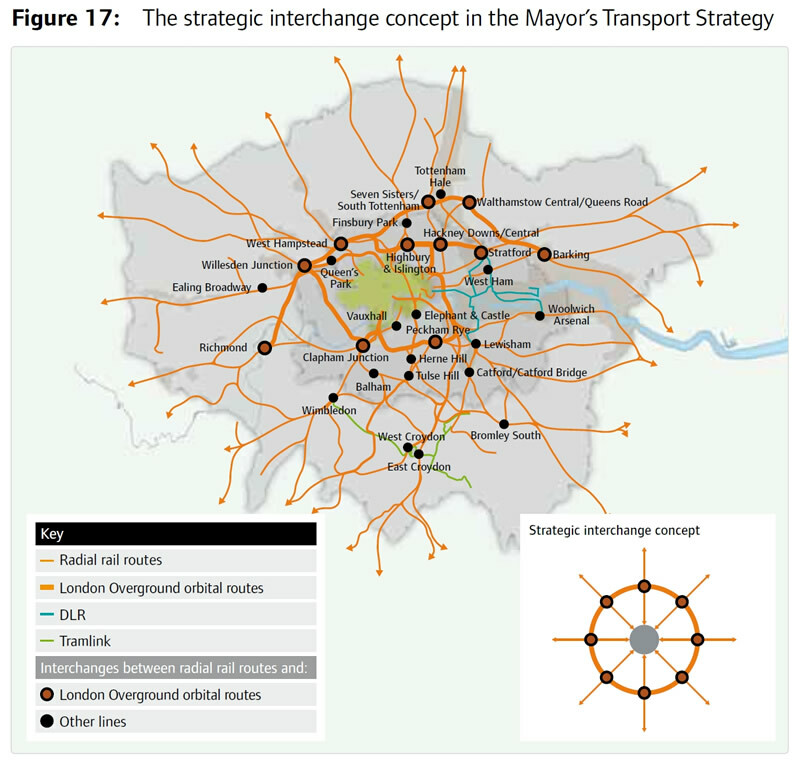 But the Mayor’s Transport Strategy recognises the emergence of new traffic centres and clusters outside the core, and the need for new transport supply to support their development. By improving the ease of interchange at key stations on orbital routes, and delivering the maximum orbital service… the network can support the development of Outer London. Passengers can make a short radial journey to an interchange station, a journey on the orbital network, and a radial journey out to their destination. This would also remove the need to interchange at busy central London locations and provide some congestion relief to the central area. But closer examination of the strategic interchange concept raises more questions than answers. For instance, what exactly is a strategic interchange? How could they be proactively used to expand the city core? What infrastructure investment is required and what changes are required to radial service patterns? A glance at the projected overcrowding on their Overground orbital routes indicates that this concept will gridlock itself before it starts making a dent in overcrowding in the core. Our look at rail freight in London showed how passenger and freight are not the happiest of bedfellows on the orbital routes, and identified that the few options to expand capacity were not being realised. Something will have to give. Back to the HLOS and, as the DfT metrics acknowledge, one way to reduce overcrowding at the terminals is to transform the radial routes into cross-city lines. This maximises capacity due to the efficient route utilisation when trains travel straight through, compared to the turnaround at termini. But “Crossrails” are very expensive, and there is a limit to how many radials can meet across the city core. A second way is to provide useful interchange options before trains get to the termini. Ideally, other than just orbital routes, this means radial and underground connections so that the demand can fan out. Finsbury Park provides a good model, though compromised by woeful underinvestment and overcrowding. It requires that capital is focused on these interchanges, including on new underground extensions to them. The third way is to maximise capacity on the orbital routes, so that people can change between radial routes without using the termini. This will require investment in the orbitals though, and also on alternative routes for freight in order to release capacity. Taken together, these start to form an integrated package to dissipate demand from the termini. But aside from cross-city lines that duplicate the terminal routes, they will not tick any of DfT’s HLOS metrics, so presumably will not get investment. This may well compound the problem of concentrated demand on the core, rather than resolve it. The third reason that the HLOS may present problems for London is that there is now an uncomfortable hiatus in the franchising process. The HLOS is dependent on the franchising program to deliver, but the recent debacle with the WCML franchise has resulted in two internal DfT inquiries, and in the meantime the franchise program is put on hold. This is unfortunate for London. While the WCML franchise process was falling apart, DfT were consulting on the upcoming franchises for the combined Thameslink, Southern and Great Northern starting in September 2013, the East Coast Mainline in December 2013 and the South Eastern in April 2014. 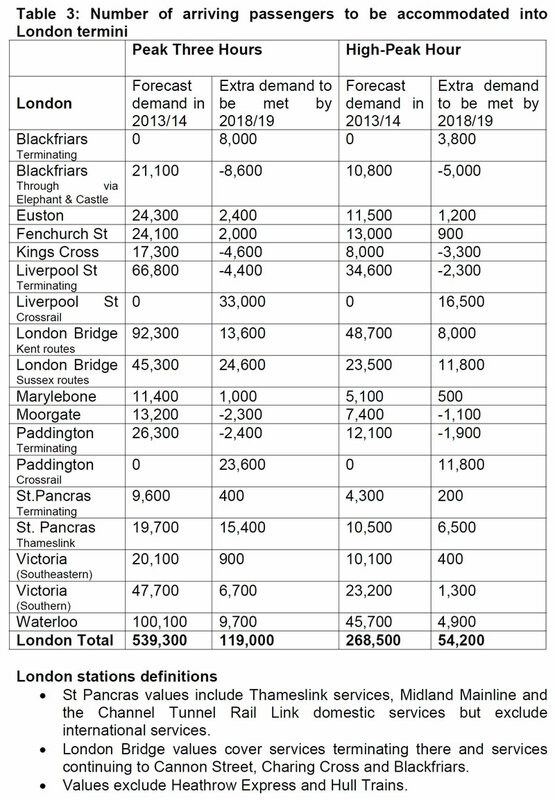 This is a significant proportion of London’s rail services. Not only is there a rapidly narrowing planning window for stakeholders to develop a robust franchise bid, but how is “the rail industry” expected to develop an investment strategy for London in this policy vacuum? Worse, how are stakeholders expected to work together to develop this investment strategy if some of them will also be competing in the franchise process? The proposed combined Thameslink, Southern and Great Northern franchise is a strange beast, where the starting gun keeps firing away. It kicks off with the erstwhile First Capital Connect (FCC) services in 2013, to which the old Southern (including Gatwick Express) is added in 2015. However, some services will transfer from the old Southeastern in 2014 and 2018, although it is not yet known which ones. In the midst of all this is Thameslink, where the service pattern suggested in the 2011 London & South East RUS has still to be confirmed. 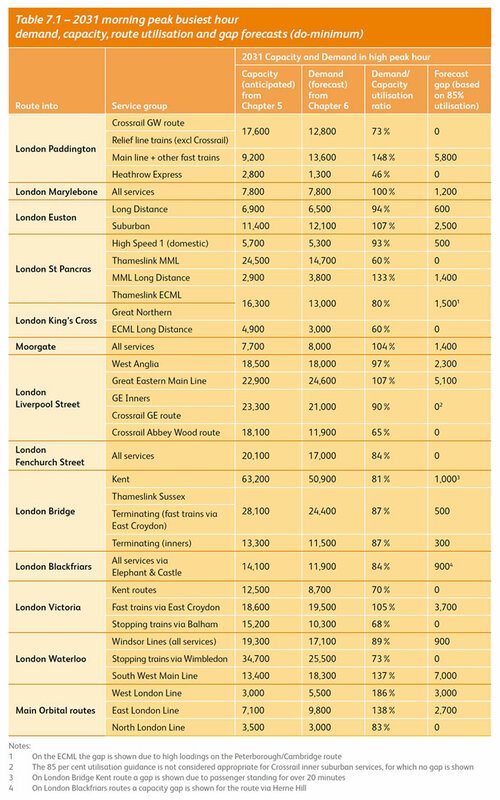 Compounding this, major changes to timetables will occur in January 2015 when Network Rail begins work on the re-building of the high level station at London Bridge (existing platforms 1 to 6) and the remodelling of the track layout in the Bermondsey and Southwark areas. Among other things, this means that no Thameslink core trains will be able to serve London Bridge for a period of three years, and that all services between Blackfriars and East Croydon and the Brighton Main Line will be diverted to run on the slower routes through south London. Fundamental timetable reconfigurations like this take years to plan. They require a very clear specifications underpinned by requisite investment in infrastructure and stock, all of which appear to be increasingly unlikely prospects. As people increasingly ask “what is franchising for?” TfL’s Overground concessions model appears more and more attractive, as does the case for a firm grip on strategic planning by a body similar to the ill-fated Strategic Rail Authority. While the current franchising regime appears increasingly untenable, we await an alternative policy from the government. But time is not on London’s side. So, will “the rail industry” step up to the mark and present an integrated investment package for London rail in January 2013? It is hard to see how, and it is likely to be some time before this strategy gap is filled. What will TfL do in the midst of all this? They will almost certainly be bidding for two of the franchises, if and when they are offered, but how will they also fulfil their strategic planning role? More importantly, how and when will the Mayor make his move to wrest broader fiscal and decision-making powers from central government? This may bring clarity and direction to rail strategy more quickly than further laborious reviews and imperceptible shifts at the DfT. This is a milieu in which an unexpected set of circumstances can create seismic shifts. While there may be some small wins, for example fighting over the scraps of the CP5 £200m for the Strategic Rail Freight Network, the bigger gains are likely to be elsewhere. The hope is that these will yield a robust and forward-looking strategy for London rail and an integrated investment program to meet the capacity challenges ahead.